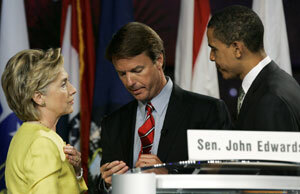 Barack Obama, Hillary Clinton and John Edwards are falling all over each other arguing that they alone have the leadership ability to achieve change. But reporters should be asking them a simple question: What kind of leadership are you showing right now? Why should we believe you have great leadership ability if you’re not showing any on critical issues currently facing Congress and the nation? By contrast to the Republican presidential candidates who talk as if President Bush doesn’t exist (see my recent piece for NiemanWatchdog.org, Rating Bush on a scale of 1 to 10), the Democrats talk about him a lot. But they act as if he wasn’t still very much in charge, still ramming legislation through Congress to fund his war in Iraq and generally subvert other key Democratic goals. It’s understandable that the presidential candidates themselves want to focus on what they would do once elected. And sure, being president is awfully different than being just one member of a political party whose majority, at least in the Senate, is tenuous. But to the extent that part of their promise to the American people is that they will be strong leaders, that they will have the courage of their convictions, and that they will reach across party lines and build working political coalitions – why shouldn’t journalists ask for evidence in the here and now? When it comes to the dominant issue of the day, Iraq, Democrats say they are devoted to ending the war. But so far they have been afraid to use – or even threaten to use – the only truly potent weapon in their arsenal: a cutoff of funds. Democrats in Congress may not have enough votes to override a presidential veto, but a simple majority is all it takes to stop writing Bush blank checks. The dominant argument against doing so appears to be that if they did, they would be attacked for being against the troops. But what kind of principled leadership is it for politicians not to act on their beliefs out of fear that their actions will be misinterpreted? True leadership demands that they articulate their position in a clear and persuasive way -- and defend it under fire if need be. And yet, even though the public is overwhelmingly against this war, and a solid majority want the troops to start coming home now, Democrats are apparently paralyzed into inaction -- by fear of being called names. Q. Why aren’t you articulating a clear position on the war? Why aren’t you willing to threaten Bush with defunding the war if you really care so much about this? Why aren’t you trying to mobilize the majority of Americans who agree with you? Why aren’t you leading protest marches? Bush’s warrantless wiretapping program may go down in history as the most egregious assault on American civil liberties since Watergate. Despite the Democratic control of Congress, Bush appears to be on his way to winning Congressional reauthorization of his program --- along with retroactive immunity for what may well have been flatly illegal behavior by obliging telecommunications companies. Once again, most Democrats (Sen. Chris Dodd being a notable exception) appear to be afraid to stand up to Bush out of fear of being attacked as unpatriotic. Once again, they are crippled by their failure to clearly articulate their viewpoint: that civil liberties are worth defending, and that a devotion to civil liberties does not preclude being tough on crime and terror. Q. Why haven’t you been more outspoken in support of civil liberties? Why have you done nothing as the government built an enormous surveillance apparatus which is used to spy on American citizens without probable cause? Why have you failed to reach across the aisle and put together a bipartisan plan that reasserts that domestic surveillance can only be conducted with a court warrant? And then there’s torture. Bush’s semantic feints aside, it’s clear that the Bush administration has engaged in torture – and wants to keep open the option to do so again. If there was ever a cut-and-dried moral issue, it is this. If there was ever and issue upon which to make a stand, it is this. Q. Why haven’t you done everything in your power – coalition-building, speechifying, filibustering, whatever – to stop this country from having anything to do with torture? On these issues and others, including the all-important budget, Bush is winning time and time again because, despite his atrocious approval ratings, the Democrats won’t hold together and the Republican won’t break from the president. Why have none of these supposedly great leaders running for president been able to keep the Democratic party together? Why have they failed to win over any moderate Republicans to a more moderate course? Q. If you can’t build any kind of bipartisan governing coalition now, why should we believe you can do it later? Two ugly, crippling and fundamentally un-American cultural changes have afflicted this country in the Bush era. One, wholeheartedly encourage by Bush, has been the ubiquity of fear. Rather than respond to 9/11 with an appeal to fearlessness, Bush used fear to achieve his policy goals and political objectives. The other cultural trend -- actually discouraged by Bush, though listlessly – has nevertheless taken root during his tenure: A creeping and mean-spirited nativism. Q. Why aren’t you urging Americans to be brave? Why aren't you urging them to be more tolerant? Why aren’t you condemning the new anti-immigration fervor in the strongest way and constantly reminding voters that we are a nation of immigrants and that these are human beings people are talking about so viciously? Q. Are you afraid of being called unpatriotic? Are you afraid of being attacked if you stand up for what you believe in? Are you afraid of sticking your neck out too far? Is it leadership ability you lack – or is it courage? I would like to ask Maccain why he lives on his past record, He is constantly bringing up what he has done in the past. During the past two debates when he has been asked what he is going to do to in the furture to correct the issues that are upon us. He can not seen to come up with a strait forward answer. I'm kind of concern because it seems to me that he has no realization of what it is going to take to fix any of the inner country issues. It seems that the only real answers he can come up with is the military questions. It very concerning to have a president that know nothing but war time affairs. Obama on the other hand has all the answers but he has no idea or experiance on how he is going to acomplish them. Republican presidential candidates avoid talking about President Bush, for obvious reasons. But journalists should press them to say what they think of Bush's legacy, which elements of his presidency they would emulate, and which they would reject.